NEW! Oodles of doodles, dots and lines...everything you need to explore ideas and find inspiration. Adult coloring books available in 2 sizes. 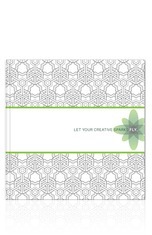 Each journal features 30 sheets of predesigned (Organic or Geometric themes) filler with lined, dot, blank, coloring sheets, and motivational quotes. Click on the products below for more details!